We have talked before about life cycle assessment (LCA) of products manufactured with composite materials. Here is a paper discussing the life cycle of a surfboard. A surfboard is more or less a composite sandwich structure. The core is either a polyurethane foam core or eps foam core. A wood stringer is added down the center for stiffness. The skins are generally woven 4oz fiberglass, often 2 layers on top and one on the bottom. 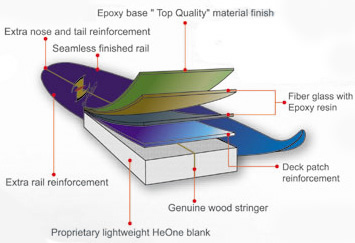 Resin is epoxy or more commonly polyester. In the life cycle analysis paper, the author cites more carbon emissions are created driving to and from the beach then the life of the surfboard will ever produce. Recently, companies have been experimenting with greener surfboard materials. In particular, bio-based resins, fabric, and foam. However, at least from a greenhouse emissions point of view, the composite construction of the board is a moot point in comparison to the emissions surfers generate driving to the beach. I imagine similar studies for other products manufactured with composite materials will find similar statistics. It also exemplifies that we need greener transportation, and composites will play a role in reducing automotive weight and increasing fuel efficiency.